The Flying Guillotine (1975) was the first movie to feature this deadly flying weapon, starring Chen Kuan Tai and directed by Ho Meng Hua. It became quite a sensation and soon sequels were popping up. Fast forward to 2012, Andrew Lau from Infernal Affairs had another go at it, giving us an even more deadly and faster weapon. In this updated version set in the Qing Dynasty, Leng is the leader of a secret assassination squad known as The Guillotines. He has six, well trained warriors working under him and they kill anyone who’s against their Emperor. Their latest mission is to hunt down Wolf, a rebel leader of The Herders. After a brutal showdown, the guillotine squad manages to capture Wolf, but he soon escapes while taking a female guillotine member as hostage. Accordingly, the stage is set for a bigger showdown. As Leng sets out with his squad, the Emperor also sends out another army, armed with guns and cannons to annihilate Wolf and his Herders. Evidently, The Guillotines has a big budget and it shows. It starts off with a stylish and bloody battle as we are introduced to Wolf and each member of the Guillotines. The overall look is gritty and atmospheric, but unfortunately, the high tech computer animated guillotines look too gimmicky, and no matter how fantastic they appear on screen. Lang is played by Ethan Juan, though both young and fresh, he’s able to perform sufficiently as the doomed leader of the Guillotines. Shaun Yue plays Haidu, the leader of the heavily armed squadron the Emperor sends out to hunt Wolf. Interestingly, Haidu’s second and darker mission is to kill all members of the Guillotines, since the Emperor has decided to use more modern Western weaponry, and consequently, the Guillotines will have no place in his history book. Shaun and Ethen are well put together for their roles; both are able to bring out the different temperaments of their characters. 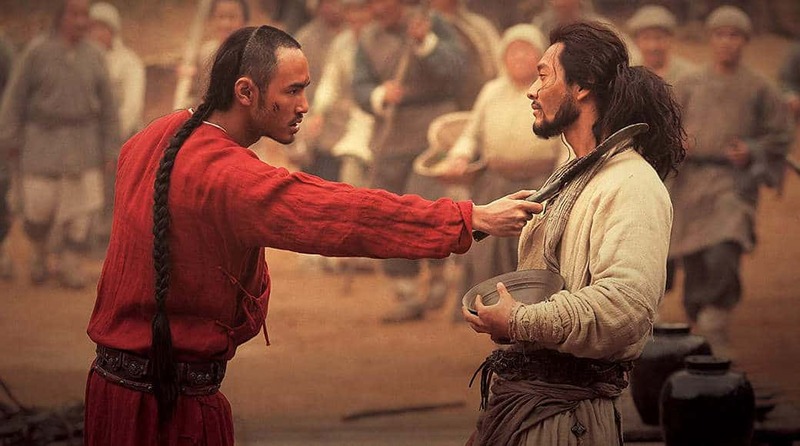 Taking on the role of Wolf, leader of Han rebels, the Herders, is Huang Xiaoming. He’s dressed in white, has long wild hair and sustains a designer beard, almost a version of a Chinese Jesus. Moreover, his followers are even stranger, they always seem friendly, very much into cooking and everyone is just so happy and well fed. However, the best cameo comes from Shaw Brothers’ veteran Jimmy Wang Yu (The One-Armed Swordsman). He plays the Commander of the Guillotines with calm authorization. As it turns out, this movie is not really about those guillotines weapons, director Andrew Lau also touches on human struggle with some historical facts thrown in. Viewers looking for all out wuxia action will be disappointed, there are no elaborate kung fu moves, and even the guillotines themselves are all computer generated weapons. However, “The Guillotines” looks good visually, the acting is adequate all-round and the accompanied music is put into good use too. Andy Lau And Huang Xiaoming Star In Wong Jing’s Action-Comedy “Mission Milano” – First Trailer!